Budget Hostel Zodiac is a truly budget concept hostel, which offers high quality beds and rooms to backpackers, to travelers and to everyone, who wish to stay in a real hostel, with experienced, friendly, trained and informative staff members. We scrutinized hostel industry, travelers needs and did our best to make your stay really cheap, comfortable and memorable. Very central location, full of university buildings, clubs/bars/cafes, and supermarkets, post offices, ATM's, exchange offices, banks, 5 minutes walk to Tbilisi Zoo and 15 minutes walk to the biggest central park of town with turtle lake. Bus stop is 50 meters away from hostel. Railway station is 5 stops away and Freedom square is 6 stops away. Hostel is located in the most prestigious district of town, with a Tsarist Russian style architecture. 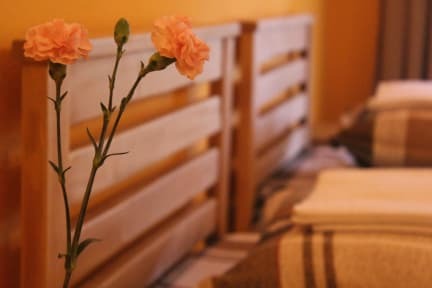 Budget Hostel Zodiac offers beds in smoke free and soundproofed dormitory rooms, as well as well-furnished private rooms for one, two, three or four people, nine (yes, Nine!) 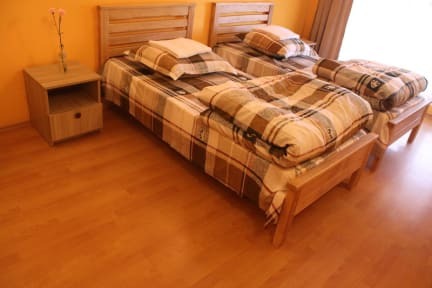 showers and toilets, huge dining space, fully equipped kitchen, Free lockers,, Free luggage storage, Free towels, unlimited Free tea and coffee, terrace, TV room, lounge space, high speed Internet connection, excellent continental and American breakfast, laundry service, tours, airport pick up and drop off service and public transport chip cards for Tbilisi city. Guest is able to check in anytime, since the hostel works 24/7. If the guest wants to check in earlier than 13:00, he/she should make a reservation of previous day as well.